Nanites: Roto is able to transform the nanites into a suit of armor. Rotor hails from Walrus Island in the North Sea where his family was part of the Walrus Herd. His father, Sherman Walrus, was a veteran of the Great War, serving as a member of the Acorn Kingdom Army along side Jules, Bernadette and Sir Charles Hedgehog as a driver for their troop. His mother and little brother Skeeter remained in North Sea however. Rotor was in Mobotropolis during Dr. Ivo Robotnik's coup d'�tat but was evacuated to Knothole Village along with the other children in the city. Inspired by the Original Freedom Fighters, Rotor joined with Sonic, Princess Sally, Antoine D'Coolette and the young Miles "Tails" Prower to form the Knothole Freedom Fighters after the original group's demise. When he and Sonic were travelling the southern regions of Mobius, the two witnessed the helpless Bunnie Rabbot captured by two SWATbots to be roboticized. Although Sonic went to save here, he was temporarily stopped as he was attached to Rotor by tether. After rescuing the partially-roboticized Bunnie, the two brought her back to Knothole Village where she became a member of the Freedom Fighters. When Sonic was amnesia-ridden and convince by Dr. Robotnik to attack the Freedom Fighters, Rotor's security systems detect the micro-transmitter placed on Sonic to provide the location of Knothole. Rotor attempted to keep Sonic out of their secret hideout by was bypassed by Sonic with relative ease. Eventually Sonic's memory was restored and the device removed. Rotor later developed the "Neuro-Overrider", a device which would allow a Mobian who was roboticized to maintain their free will. Sally hoped to use this to allow herself to be roboticized so she could then infiltrate Robotropolis and steal a roboticizer to learn how to reverse its effects. The Neuro-Overrider fell off Sally as she was roboticized however and she was robbed of her free will. She was safely restored to normal by Dulcy the Dragon. After receiving a distress call from his mother in the Northern Sea, Rotor piloted his Bathysphere and travelled there to see what was wrong. Upon his arrival, Rotor discovered his family and the entire Walrus Herd had been placed under mind control from a Neuron Bomb by Dr. Robotnik. When he discovered that Robotnik was hoping to freeze the entire planet, Rotor attempted to escape and warn his friends, but was knocked into the ocean by an Icebot. He was quickly rescued by two of the Arctic Freedom Fighters Sealia and Augustus. The three then managed to infiltrate the Herd and Rotor attempted to free them of their mind control. However, the entire Herd attack Rotor, though Sealia and Augustus managed to save him and bring him to safety. Rotor vowed to return and liberate his family from Robotnik's mind control. After the Knothole Freedom Fighters (except Sonic) were infected by a biochemical weapon from Robotnik, Rotor managed to inform Sonic of what had happened before falling unconscious. Sonic used the Shrink Ray to become microscopic and go inside Rotor to assist his Aunti Body in the fight against the French Frirus and Paris-site. Sonic was successful and Rotor and the others recuperated. Following this, Rotor attempted to de-roboticize Sonic's Uncle Chuck. Despite his efforts, Chuck remained a Robian. Not long after this, Rotor created a remote which enabled the Freedom Fighters to travel to the Zone of Silence and locate Sally's father King Max. However, due to King Max being under some sort of spell, the Freedom Fighters are unable to retrieve him and are forced to return back to Mobius Prime. Some time later, Rotor sat on the council to review Sonic's idea to use the Neuro-Overrider and allow himself to be roboticized. Rotor objected along with the rest of the council, saying the idea was too risky. After Sonic is captured by Nack the Weasel and roboticized, Rotor helps prepare Bunnie to defend the village against Mecha Sonic. After Bunnie was defeated and Knuckles the Echidna was knocked out, Rotor managed to catch the Echidna in a net during his fall. As Knuckles came too he suffered from delusions, and attacked Rotor as he thought (due to his weight) he was Robotnik. Sally managed to knock Knuckles back into his senses however and the fight continued. Rotor oversaw the Neuro-Overrider used on Knuckles to allow him to keep his free will while becoming Mecha Knuckles to combat Mecha Sonic. After the battle ended, Rotor worked with NICOLE to transform the damaged Mecha Sonic back to a Mobian. Weeks later, with the help of Rotor's Neutralizer, Sonic travelled to the Zone of Silence and was able to finally rescue King Max from the Zone of Silence. Following this, Rotor worked with Dr. Quack to create the Dream Watcher so that they could look into King Max's mind and bring him out of his comatose state. Sonic managed to do this, though King Max remained in his crystallized state. Days later, Rotor revealed his new weapon to Sonic, the "Party-Hearty Quadra Sonic Rock 'N' Roller", as well as his Remote Scanner. The same day the Freedom Fighters found themselves working with Knuckles the Echidna to fight Anti-Knuckles and Anti Sonic. They then went to Anti Mobius where they discovered Dr. Ivo Robotnik stealing the energy from the Sunken Island's Chaos Emeralds. After Robotnik was transported back to Mobius Prime, Rotor was disappointed he never got to use his Remote Scanner during the ordeal. During Operation: EndGame, Rotor was in Knothole when Dr. Robotnik arrive on the scene. Saying "Robotnik in Knothole? Not in this lifetime!" he attempted to blast Robotnik with the Party-Hearty Quadra Sonic Rock 'N' Roller. Robotnik managed to phase out the gun's blast and destroy it, taking the entire village hostage. Rotor and Tails later managed to sneak into the sewer system, but were caught trying to escape by Combots. With the death of Dr. Robotnik caused by the Ultimate Annihilator, Rotor decided to return to the Herd. When he arrived back he was relieved and astonished to find that the Herd had regained their free will as a result of the Ultimate Annihilator firing. He spent several weeks with the Walrus Herd, enjoying time with his mother and younger brother Skeeter. However, while there Rotor was unaware that Robo-Robotnik had travelled to Mobius Prime and replaced the late Dr. Robotnik. Thus when the herd suddenly came back under the mind control spell, Rotor did not know what was going on. Hiding out in his Bathysphere, the Herd managed to damage it and cause it to sink. Rotor was rescued by the Arctic Freedom Fighters, who informed him that Robotnik had returned. Returning to Mobotropolis as he was unaware it was re-conquered by Robo-Robotnik, Rotor found himself meeting up with Mina Mongoose and shortly afterwards Sonic. The group returned to Knothole and Rotor began attending Knothole High School along with his other Freedom Fighters. After the Freedom Fighters learned the Sword of Acorns could restore Robians' free will, Rotor asked that they could use it on the mind-controlled Herd to restore their free will as well. Returning to Walrus Island, Rotor planted a bomb on the Walrus-constructed Oil Rig while Sally used the Sword of Acorns to restore the Herd's free will. Rotor helps his friends any way he can, even acting as a quasi-mentor to Tommy Turtle, helping him become acquainted with his new life. Unfortunately, this relationship came to an end after Tommy was enslaved by A.D.A.M., resulting in his death under the guns of the Egg Fleet. Rotor was also one of the prisoners taken by Eggman during the destruction of Knothole, though quick action by the survivors of the attack resulted in a successful rescue mission. However, injuries to his back (caused by him shoving Tails free from beneath a collapsing roof during the destruction of Knothole) left him unable to participate in Freedom Fighter activities for some time afterwards. Rotor was elected a member of the new Council of Acorn, a group of six elected members and King Elias established to bring about some much-needed political changes in the Kingdom. Rather than get a break from the stress of combat, however, Rotor found himself in the middle of an even more dangerous situation: Knuckles' arch-nemesis, the Chaos Emerald powered entity called Enerjak, had been reborn thanks to the machinations of the Dark Legion scientist Dr. Finitevus and was intent on conquering Mobius. 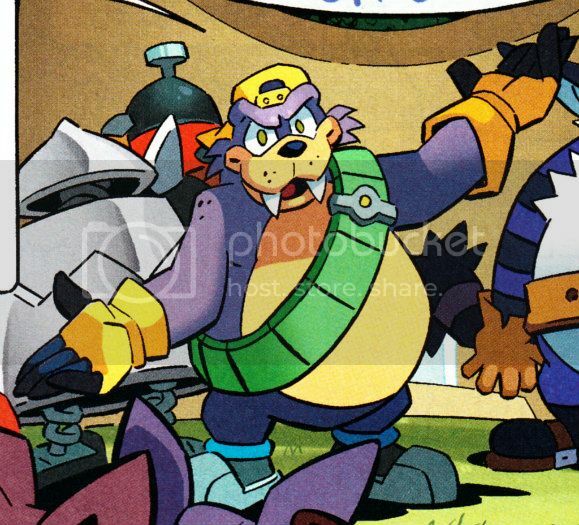 Rotor was attacked by his Anti Mobius counterpart, Boomer, who mocked him for not being able to defend himself. Rotor was brought to tears when he was unable to help defend Freedom HQ from the Suppression Squad as a result of his neck injuries. Instead, he fled the scene to contact the Chaotix and was later seen at Sally's hearing. Now Rotor is back on the field team, seen heading into battle with the rest of the Freedom Fighters and Chaotix against the Dark Egg Legion. After the Egg Phoenix was destroyed, Rotor then placed a force field generator down so the Freedom Fighters could call it a day, but he failed to get any sleep himself and instead readied the visual link to New Mobotropolis. He later stayed behind while the others went on the final assault, and after Sonic managed to defeat Eggman, Rotor helped transport them home in his jeep to celebrate their victory. Their victory was cut short as the Iron Dominion took over the empire, which the Freedom Fighters would learn from Monkey Khan. When the Iron Queen took control of NICOLE and thus all of New Mobotropolis, Castle Acorn was sealed shut, trapping the royal family and Council of Acorn within. Rotor was later revealed to have been taken prisoner and was among those brought to the Coliseum for public "legionization" -- a process that forcefully converts a Mobian into a brainwashed Dark Legion cyborg. When Rotor was brought out before Snively, who was in charge of the operation, he angrily reminded the Overlander that they had worked together in the past; smugly dismissing this, Snively was caught by surprise when Rotor suddenly attacked the Legionnaires holding him, subduing them simultaneously before lunging at a terrified Snively. Unfortunately, Rotor's heroic efforts were quickly halted by his injured back flaring up. Fortunately, Amy Rose, Antoine and Geoffrey St. John soon appeared, and Amy destroyed the operating table to which Rotor was being dragged, scattering the villains and saving the walrus. With the threat of the Iron Dominion ended, Rotor and his fellow council members set about revising the new constitution of the Republic of Acorn. As such, Rotor did not accompany Sonic and Sally to become a member of the Wolf Pack Nation despite having been invited. Just as Sonic and Sally helped resolve a crisis there, however, Rotor was informed by Hamlin that the Arctic Freedom Fighters had called in with news that a Dark Egg Legion chapter had captured the Walrus Herd. After learning of the situation, Sonic invited Rotor to go along with him, though Hamlin was quick to deny the Hedgehog's request, and Rotor agreed that he planned to stay in the city. However, after having NICOLE meet him at his house, he informed her that he had every intention of going to aid the Herd, requesting that she construct a suit of armor from the nanites for him. Departing, he flew to the Northern Tundra, contemplating his previous actions as a Freedom Fighter and determining that he would retire permanently once this mission was completed. He was then dragged out of the air by Silver the Hedgehog, whom he engaged briefly in battle only to find himself helpless. Silver then accused him of not being "Boomer" Walrus, and then of being a traitor to the Freedom Fighters.